This past week Rosie got to take a short walk around parts of the farm under saddle. I had a feeling she hadn’t been out in the world at large much before I got her so it was time to test out my theory. My guess is that she was kept in a stall and only let out for short times in a paddock or to work. She’s gotten the whole, “Oh, I stay out all day now,” thing down pretty well and she’s adapted to being the only girl in the herd. She still hangs near Blue most of the time but occasionally she can be seen with Grady or Sami. Blue can be a grumpy old man and although older men should be wiser and safer sometimes he’s just a pain. Sorry Blue, but you are. After she was mounted in the outside arena and thought she was going to work in there, she got a surprise and was walked out and down the driveway to the gravel road by the pond. She wasn't too crazy about the pond because there is a beehive beside it and there are huge carp in there that can be seen swimming near the surface at times. Even Grady spooks when the carp swim by. So, for her first time out she wasn’t forced to stay anywhere she wasn't comfortable because she was a little nervous. Next, she went on with her excellent adventure to explore the path around the outside of the indoor arena. This went a little more smoothly in the absence of strange wildlife. She then was taken into the catch pen and into the next paddock to walk around in the shade under the trees. She’s not only used to being in there everyday, but there was a nice breeze in the morning so it wasn't too hot yet, and it seemed like a nice way to end the ride. What I like about Rosie is even though she gets worried or nervous, she doesn't have a big spook in her. She doesn’t bolt or spin. The most she does is break into her little western jog. It must be what she feels safest with and so she reverts to her comfort zone. Which is totally manageable. After this successful outing, Rosie will have lots more time out of the ring and little by little she will go farther afield as she gets used to being out by herself. Now, it would help if Sami would stop calling to her the whole time she’s away from him! Fun walkabout exploring new things with your girl! I like your non-forcing approach, and ending with a familiar spot. I bet the more you do it, the less Sami will call. For a little guy Sami has a very big mouth! He just wouldn't stop calling her, good thing she pretty much ignored him though. Yes! I'm just about ready to start riding tool. It was cool here today, but I was too busy to make my debut in the saddle. Rebel is quite like Rosie! The weather has been so miserable but I think or hope it will start to cool off and the biting insects will disappear. Rebel seems such a steady eddy sweetheart I’m sure you’ll have a lot of great rides. I like your analysis of bolting versus jigging. My horse cowboy, was like that, too. Like you, I always felt I could handle it. I think riding out near home is the most challenging, so if she is doing that pretty well, it says a lot of good about her. I feel more safe putting them in the trailer and taking them down the road to a neutral spot. But when I ride around here, they act up much more. It sounds like you are having a lot of fun with her! We are having fun getting to know each other. She’s very sweet and a people horse. She likes attention and snuggles and hugs and scratches. She really enjoys being groomed too. So it’s all good. What a great way to get her used to things. The idea that she had such limited turn out is sad. 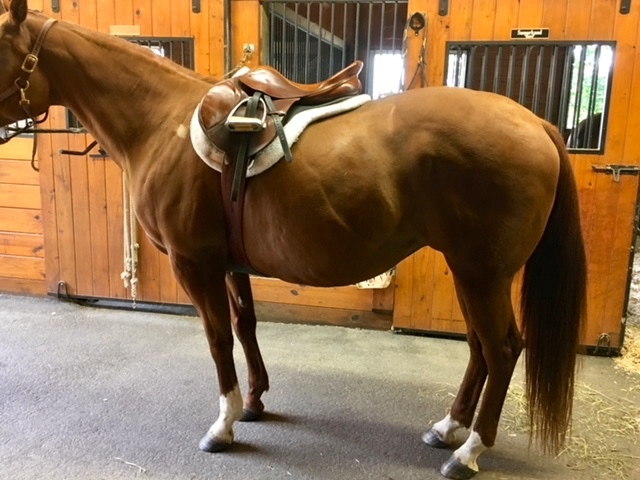 I’m not sure about her turnout situation with previous owners but I do know she had limited turnout in the sale barn for about a year. She does like to look around at things, which is fine. I prefer a horse to check things out and be able to deal with different situations. Wow! She’s really settling in nicely. When we got Cody we met him in a huge western barn that had many Quarter horses and they lived exactly as you describe - in stalls almost all the time with very limited turnout (which they were taken to by someone in a golf cart holding a long lead line) and mostly ridden in windowless indoor arenas that were accessed through long indoor hallways. There was loud music playing nonstop. It would have driven me mad to ride there, much less live there. But Cody is a wonderful guy and he does a very simple spook-in-place that rarely happens but isn’t at all difficult to manage when he does it. For years that little western jog was his default gait but gradually we encouraged him to open up his body and express himself a bit. My goal for the fall is to get him back into work. We’ll have to share notes! :) She looks amazing in that saddle!! It always amazes me how adaptable horses are. They simply adjust to their surroundings given time. The barn where Cody lived sounds like it would have driven me crazy too. I like peace and quiet. Rosie sounds a real delight! Such a good girl even when she's unsure. 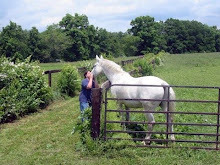 I love reading your progress with her, especially your approach of not forcing and thinking of the horse's needs. Hi Joy, good to hear from you. Sami does like her and she seems to like him too. She’s usually hangs near him or Blue during the day.